Sandstone trip in the USA: RRG and Indian Creek! After many years of dreams about the shiny orange sandstone, its perfect slitters, the peaceful desert landscape… this fall I finally booked my flight to Indian Creek! I was looking for some new experiences and, after the trip to La Reunion, I got really motivated to improve my crack climbing skills and to learn how to jam. The cool thing is that Babsi was even more motivated for it, and we both were on the good mood for starting from the basics again, with the only goal of enjoying the time there and coming back from the trip more experienced on that kind of climbing. Anyways…a little bit of sport climbing is always good ;) We decided to make a first stop in Red River Gorge , where we spent about 2 weeks. I’ve been there last year in the same period and I liked so much, that I really wanted to come back to climb on the crazy shapes of its sandstone again. I’ve always a strange feeling when I go back in a place of which I have good memories: I’ve a lot of expectations and I’m somehow scared to find it different. This time we camped at Lago Linda, a very calm and nice campground not that far from the Motherload area. It felt good to be the whole day outside again and to prepare our food after 3 spoiled weeks of restaurants in Kalymnos. The first five days were really warm, but we always had good weather; we decided to visit as many different sectors as possible to get the feeling of climbing on the sandstone again and to show Babsi around. As I spent a lot of time there last year, I didn’t have so many classics left, and so I focused on repeating some heinous and not so hard routes, which are for sure not the most famous of the area, but they are really good… and I had some hard times! ;) In the meanwhile Babsi cruised all the classics and started working another route. I really wanted to climb “Golden Ticket”, as last year I fell close to the top on my second go and for me it’s one of the coolest line in the gorges. This time I struggled more, but after some tries I started to make some good progresses and I was confident to do it before the end of our trip. Unluckily the bad weather came in and everything got soaking wet; even when it wasn’t raining, all the humidity condensed on the rock, making it completely unclimbable. We had some really long rest days, where we visited everything we could and we hiked in search of some dry climbs. Luckily the sun came out again and we managed to climb the last 3/4 days. After so much rest, I wasn’t so motivated to spend the end of the trip under one route, so we preferred to visit some new sectors and enjoying the different styles that RRG offers. We climbed as much as possible, without thinking “what” and “why” and it was for sure the best way to finish this “short” first part of the trip. The rock there is simply amazing! After 2 flights and many hours of traveling trough the snowy (and pretty) colorado, we finally arrived in Moab. It was great to see how the landscape can change fast in America: we started from Denver, we drove under the snow surrounded by 3.000 +m high mountains, we passed trough the flat desert and we ended up in the middle of sandstone towers and arches! It was worth to come down there just for the view! We had a quick check at the outdoor shop to get some gear, and we immediately met Gérome and Florence; it was nice and strange at the same time to see them there after a log time. They also just arrived, so we teamed up and we drove super motivated to Indian Creek. It’s simply amazing when you drive into the valley for the first time! There are cracks everywhere and the landscape is incredible. We stopped in the first crag we saw and we got ready to have an hard time ;) We were all pretty intimidated from all those splitters and corners, so we started from the basics again…. and it was enough! It’s crazy how hard can a 5.10 feel if you have never jammed before! When the sun went down, we drove to the campground: tired but with a big smile on our faces. I loved camping in the desert: you haven’t any facilities and the life is just simple as it should be. Everything is determined by the sun and the daily routine is just about eating, climbing, eating, sleeping (a lot!). It was nice and really motivating to see how “fast” we progressed everyday; we started struggling on the 5.9s and finished struggling on the 5.13s ;). Our goal was to learn as better as we can to jam, so we focused on doing a lot of classics on different crack sizes… and on laybacking as few as possible! The hands and feet got swollen, but it didn’t matter: at the end of the day we were always sore and tired, but HAPPY. We spent more than 3 weeks there, but the time run crazy fast; without seeing it, we were already at the end of the trip. The plan was to spend the first two weeks in Indian Creek, and than to climb some desert towers on the last one. Unluckily the bad weather came in again… after some rainy days we woke up in the snow and so we were forced to rest and wait for some better (and warmer) conditions. Finally, we didn’t have the time to do some towers, but we managed to climb 3 more days, which was more than enough for us after so much waiting. What can I say… this place gave me so many good memories, that it’s definitely one of my all time favorites! The climbing and the life there are simply pure, and to share all that with nice and important people it’s just fantastic. I was really sad to leave, but I’m sure I’ll go back there in April… so it’s just a matter of time. Now I’m back In Austria until march; it feels great to stay at home for a while, recovering from so much traveling, training for the next season and working on some projects. Stay tuned and keep on doing what you love. 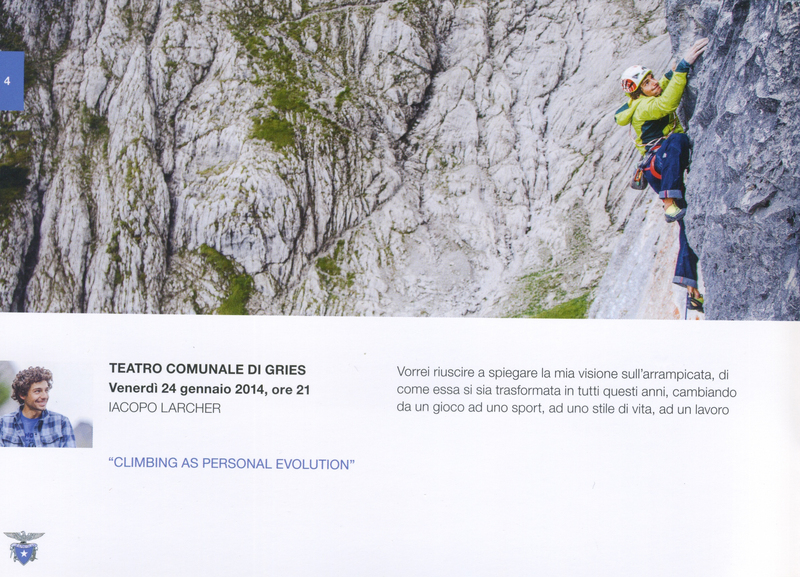 Il 24 Gennaio 2014 presenterò la serata “Climbing as personal evolution” al teatro comunale di Gries, Bolzano. L’obbiettivo è di riuscire a trasmettere, ripercorrendo le varie tappe della mia carriera, che cosa sia per me realmente l’arrampicata: non un fine, ma un mezzo per mettermi continuamente alla prova, imparare, conoscere il mondo e me stesso…e quindi evolvere come persona.